The Forms should be saved in a folder and can be used as many times as you find necessary. The original form has a “Reset Form” button at the bottom of the page, the information on the original form can be cleared and used again. Open the pdf form in Adobe Reader. After filling out the form rename it with a different name (example: All American Nomination Form). You can then e-mail the form to ladyruss88@gmail.com as an attachment. 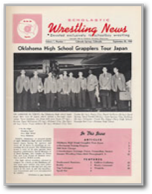 If you want to help your state wrestling programs to be recognized fill out the Nomination and Results pdf Forms on the left side of this page.